Getting down to basics. Leading proponents of philosophy, physics and the history of science meet at LMU this week for an international conference on the “Foundations of Physics”. Stephan Hartmann, Professor of Philosophy of Science at LMU, and one of the organizers, gives us a preview of what’s on offer. Three whole days, a packed program, but what is the meeting really about? Stephan Hartmann: The conference deals with issues that arise at the interface between philosophy, physics and the history of science. Philosophers are interested in the nature of space and time, for instance. What exactly is space? Is it a sort of container for everything that happens? And how should we think of time? Does time always “flow” at the same pace? Can one objectively determine when two events occur simultaneously? Indeed, can spacetime exist without objects and events to fill it? A closer look at our best scientific theories can help to clarify questions like these. It actually turns out that philosophers and physicists who are interested in the logical foundations of their discipline often ask similar questions – some of which Newton und Leibniz also probed. Very much so. Many great philosophers – Aristotle, Descartes, Leibniz too – tried to develop a philosophically plausible understanding of space and time, and many of them were also physicists. The division of labor between the two fields of inquiry first appeared later. Another major question concerns the philosophical relevance of quantum mechanics. Does quantum physics really force us to reject determinism, and perhaps even realism? A third area of interest has emerged more recently and concerns the status of statistical physics. This area is very active, indeed booming, and it is not only of considerable relevance in the context of technological applications, it also raises many philosophically troubling problems. How does one translate problems in statistical physics into the realm of philosophy? One of the central concepts in statistical physics is the idea of probabilities. Probabilities play an important role in a plethora of theories and models, and there are accepted mathematical methods for calculating them. But it is not always obvious what these probabilities mean. Are they a measure of our relative lack of knowledge regarding the precise behavior of a deterministic system, or do they reflect certain propensities inherent in the system that cause it to behave in this way or that way in a given context? To put the matter more philosophically, are probabilities in statistical physics subjective or objective parameters? We now ask which of these interpretations is the more reasonable one? What arguments can one present for each point of view, and how should these be evaluated? Interestingly, conflicting interpretations are not only of philosophical interest, they can sometimes motivate whole research programs. Let’s suppose I am persuaded that probabilities are a measure of the degree of subjective belief. Then I may well come up with different physical theories than I would if I interpreted probabilities as objective realities. Philosophical proclivities such as this can play an important, and often unacknowledged, role in the formulation of scientific theories and models. Indeed one of the goals of the philosophy of science is to make these implicit assumptions explicit, as this ultimately leads to a clearer understanding of what our physical theories actually tell us about the world. As the landscape of the sciences has become ever more differentiated and specialized in the past few decades – or rather, centuries – communication between disciplines has become ever more difficult. What lingua franca will you be using at the meeting? It is true that sometimes even researchers within the same discipline have little to say to each other. But that’s not necessarily a bad sign. The development of a differentiated and precise terminology for each specialism promotes scientific progress, and science has undoubtedly achieved great things. But if one wants to understand the larger picture, to trace connections between different research areas and disciplines, it is helpful to be able to take a more detached stance. This makes it easier to clarify the meanings of crucial terms, and identify similarities and commonalities between logical structures. Here is where philosophy can make a valuable contribution, I think. Philosophers are trained in the art of dissecting concepts and pinpointing ambiguities and contradictions. Moreover, it should be the central concern of philosophers to look beyond the boundaries of their own discipline and identify links between apparently disparate fields. That is what I have always found so fascinating about the subject. Do you already have concrete ideas for crossover projects? There are many established collaborations going on between philosophers, physicists and historians of science. Our conference is the largest of its kind ever, and with 150 participants, I hope it will give rise to many more crossover projects. The important thing is to bring the right people together, so we have scheduled long coffee breaks to give people lots of time to interact and toss ideas around. I am particularly looking forward to what our invited speakers can contribute to this. 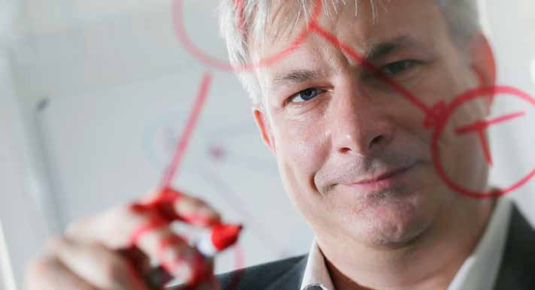 The experimental physicist Markus Aspelmeyer (Vienna) will talk about new experiments that probe fundamental elements of quantum mechanics, for instance. The lecture to be given by physicist Fay Douker (Imperial College London) should be another highlight – she will discuss the notion that spacetime is fundamentally discrete. Then I would like to mention the physicist and philosopher Julian Barbour (Oxford), who will give an evening lecture on “The Mystery of Time” at the Deutsches Museum. – For us the conference also represents a wonderful opportunity to showcase the opportunities that LMU offers to all who are interested in the history, philosophy and logical foundations of physics. Perhaps we can persuade some of the attendees to come to Munich to pursue a research project with us.